I was surprised to find that this old favourite ink has only one review on the FPN, and that has unfortunately lost its picture. Time, I thought, to post my own - especially now I have access to a flatbed scanner! Waterman's Havana Brown is a great ink. The colour is a lovely reddish brown, reminiscent of cigars and rosewood. It's readily available - almost as common as bottles of Quink - and comes in distinctively chiselled 30ml bottles at a fair price. 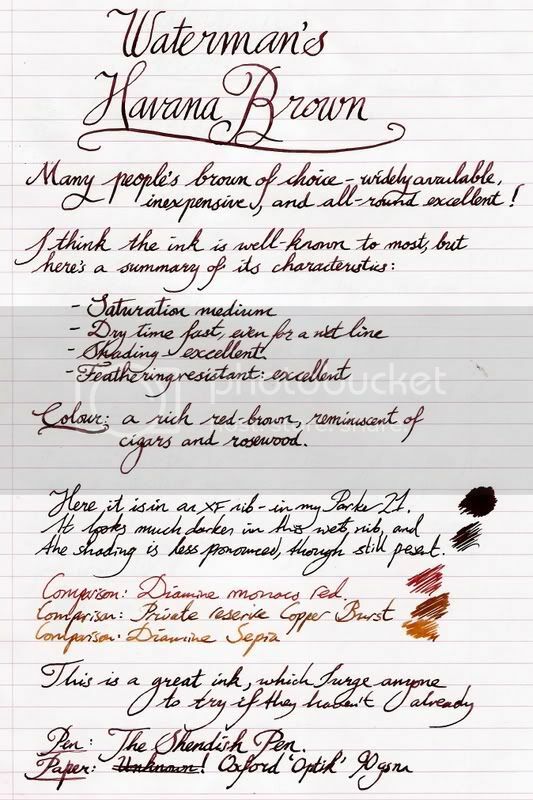 Here, I've given comparisons of PR's Copper Burst and diamine's Sepia and Monaco Red. The pen is The Shendish Pen (a wonderful old BHR Flexi) and the paper is Oxford's Optik 90gsm, which I think is an excellent staple. This is my first review - I'm about to post six - and I'd appreciate feedback and questions. I picked up a bottle of this a couple of weekends ago. I love this ink. It's just not waterproof, and around me... who tends to spill things... that's not a good thing. But, gosh, this ink looks lovely on some cream or ivory colored paper! Thanks for the lovely scan and review! Oh well, that's why I am hopefully acquiring some FPN Galileo Manuscript Brown. Edited by Reginleif, 08 July 2008 - 21:05. It's just not waterproof, and around me... who tends to spill things... that's not a good thing. If you spill the ink, though, you'll be very grateful for its easy mopability! Havana is my "go to" ink. A perfect review for a perfect ink. Thanks. Reginleif - you'll enjoy the color and fastness of the FPN Galileo (it does have the expected nib creep though). Nice review and excellent writing style. Too bad the Havana Brown is not waterproof, because from what I see in your writing sample the color seems to be a nice robust dark brown with good contrast. I'd like to compare Waterman Havana Brown with Private Reserve Chocolat and FPN-Noodlers Galileo Manuscript Brown. I have used PR Chocolat before. Today I inked with Galileo's brown my Pelikan Sahara with a Binder medium cursive italic nib. In my writing, which is not as good as yours, Galileo Manuscript looks lighter than Chocolat, with a nice shade of redish brown on regular white office paper. So far Galileo is flowing wet and dries relatively fast. Can't post samples because I don't have a color scanner. Anyway, thanks for the Havana Brown review. I might buy a bottle just to try the color. I love Waterman Havanna but I must admit that I don't use as often as I would like...I am a bit worried about what will people think at the office if they see me writing with this color. For most of them, I am already "original" enough by using these fountain pens! But now that I have received a 2-pen case I am seriously thinking of taking to work one pen filled with Havanna and other with Waterman Blue or Quink black, so I have both options. It's been about 24 hours since I followed the directions and sent an email with an order. I'll give it another day or two before I inquire as to the status. I'm eager to try it even more, now. And nib creep... since the bulk of my ink collection consists of Noodler's bulletproof/waterproof inks, I'm used to it. Bleh. Oh well, small price to pay and it doesn't hurt the pen any. Thanks for a nice review. I haven't used Havana for a while, I must order a new bottle. Nice review of an old favourite of mine. I havent used this ink for a while as I am using Diamine Saddle Brown, which I think is very similar. I still have a bottle of Havana Brown though so I must load up a pen and try it again. I can't use this colour at work as I have had too many comments about it, so I am using Diamine Damson for work. Outside of work brown ink is still a love of mine. Edited by david6, 31 July 2008 - 17:00. 3. Pelikan (M805 OM; Pelikan Blue-Black). Very nice review! Nice handwriting! I have my yellow Lamy Safari (ef) loaded with Waterman Havana Brown. Love it! Someone has some SERIOUSLY good handwriting here, and it ain't me. I've always loved havana brown, along with florida blue, two bottles I am never without. thanks for the review. i couldn't agree more to the positive words, havana is so good and easy-use. Indeed, Havana brown is an excellent ink for daily use. Love it! Thanks for bringing this ink back into the limelight. Nice review and better handwriter. Waterman Havanna is one of my favourites ink. I bought the first bottle two year ago, and I usually write with this ink. Thank you for the review. This is my go-to brown for almost all uses. Havana Brown is the gold standard for brown inks. I love it! Sorry if I missed the review comment: does it have the same flow characteristics as Waterman Florida Blue? Thanks. Good review and very nice handwriting. Would love to see a comparison with Noodler's Walnut. I really like a dark brown ink with not too much red. Also curious on a flow comparison between the two. Walnut has a really smooth flow and did wonders to my troublesome MB. Wondering if Havana Brown is even better. Knowing what they say about Florida Blue being a wonder ink.